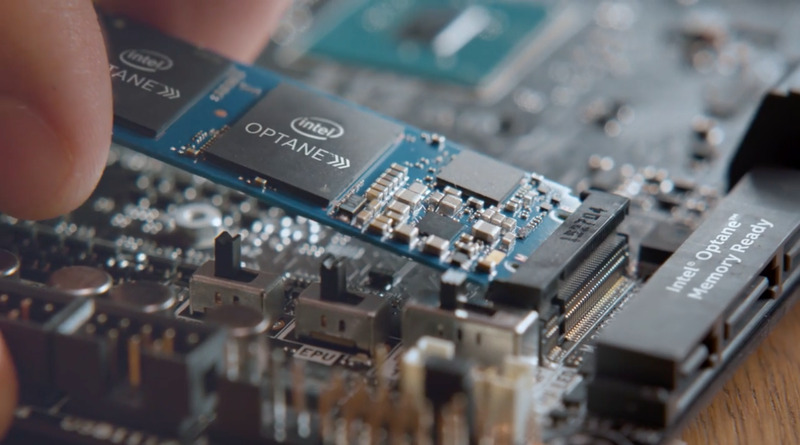 Intel's Optane memory module on a Stoney Beach motherboard. 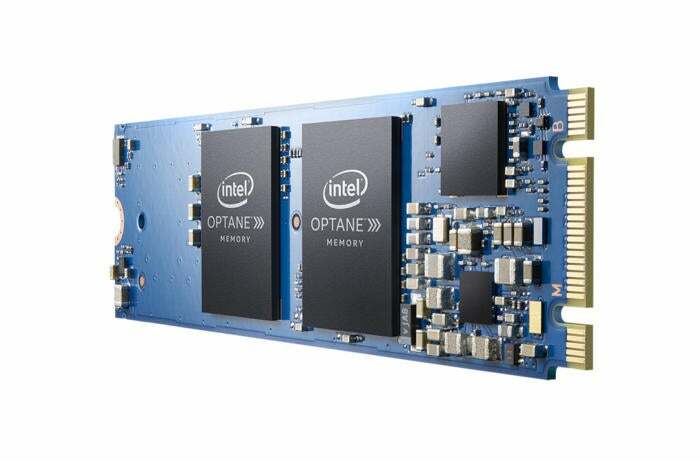 Developed internally with partner Micron as 3D XPoint, which the companies claim is a "new class" of memory, Optane will act as a high-speed cache in conjunction with either a larger capacity hard drive or a SATA SSD. The low capacity of Intel's Optane modules will enable it to be affordable as well, the company said. "Improving speed while maintaining large storage capacities is ideal for virtual reality, gaming, content creation and video editing and so much more," Intel said in a statement. "The performance of a 7th Gen Intel Core processor plus the speed of Intel Optane memory boosts responsiveness across the system." Other than detailing Optane module capacities and form factor, Intel released virtually no other details about the memory, including performance specifications, pricing or exact availability dates. A spokesman for the company said additional detail, including performance specifications, would be released "soon." In June, Intel let slip its plans for releasing several product lines based on the new 3D XPoint memory, which it said it would release alongside its Kaby Lake processor platform. In August, Micron revealed its own separate go-to-market plans for 3D Xpoint memory, which it will sell under the name QuantX. 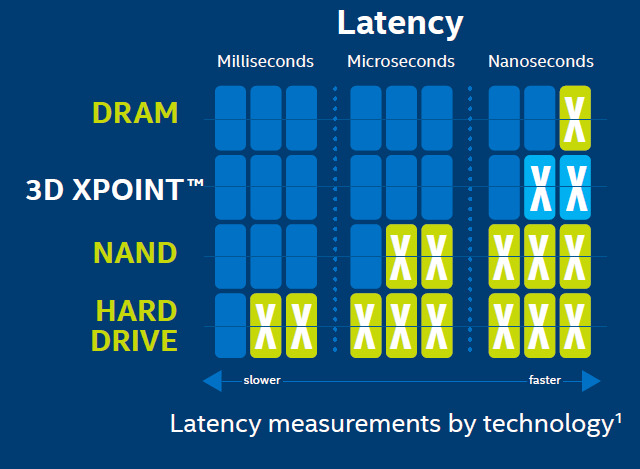 Both Micron and Intel claim the new non-volatile memory sports up to 1,000 times the performance of NAND flash. Currently, Micron expects to see its first revenues from QuantX sales in the second half of 2017, with 2018 being a "bigger year," and 2019 being the "break-out" revenue year, Carter said. 3D Crosspoint will be about half the price of DRAM, but around four to five times more expensive than NAND flash, Carter said. So while it will replace DRAM for many applications, it's not likely to replace NAND flash -- at least for prosumer applications --- anytime soon. Intel's Optane M.2 memory module being inserted onto a Stoney Beach motherboard. Carter said demand for QuantX memory is "through the roof" from system manufacturers and there's currently not enough stock to go around. "We've built the capacity for the first couple of years; it's all accounted for," Carter said in an earlier interview with Computerworld. "I've been in situations with partners who buy a lot of DRAM who've said, 'Do you know how much DRAM I buy? You'd better get me some 3D XPoint.' "